We set out to create the absolute best super-absorbent dog towel in the world because we love dogs as much as you do. The Absorber® is made with your dog’s comfort in mind. You can rest easy knowing that when you use The Absorber to dry your dog, the task will be done quickly and efficiently . 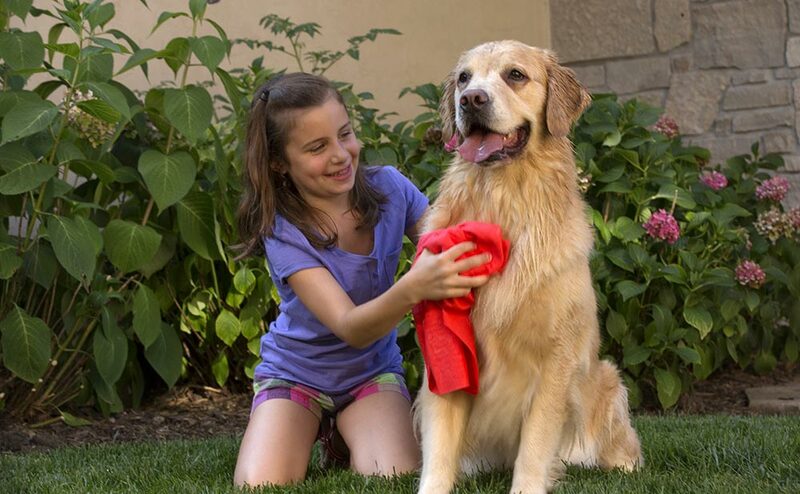 Our commitment to your dog’s comfort makes Dog Lover’s Towel the leader among super-absorbent towel suppliers for loving pet owners and professional groomers alike. Nothing on the market beats The Absorber for drying dogs. Made from a unique Poly Vinyl Alcohol material and using sponge-like construction, The Absorber has drying capabilities that make it the natural choice to replace your old dog bath towels. The advanced capillary action of The Absorber allows it to quickly and effectively draw water away from your dog’s fur. Its fast-drying capabilities mean your dog can spend less time having to stand still while you dry him or her. In addition, the smooth surface of The Absorber means it won’t tangle your dog’s fur no matter how shaggy he or she is. When you use The Absorber, you’ll make bath time much easier and more enjoyable for you and your dog. Nothing compares with The Absorber when it comes to keeping you and your furry friends happy after bath time. Read on to learn more about what makes The Absorber the ideal choice for drying your dog quickly. EASY TO WRING: Releases water easily and keeps working; no need for multiple towels. MACHINE WASHABLE: The Absorber can be used again and again as a dog drying towel, so it’s better for the environment than disposable towels. SAVES TIME, ENERGY & MONEY: These absorbent dog towels do not go in the dryer, so you reduce energy usage while saving time and money. CONVENIENT: Comes in a tube for storing at home or to bring when you're on the go. COOLING: The Absorber can also cool off your dog on a hot day; hold it under cold running water for a minute or two and drape it around your pet. AFFORDABLE: Only $16.99 per towel! Before using The Absorber for the first time, rinse it by hand with warm water or wash it in the washing machine with liquid detergent and warm water. When The Absorber is wet, just wring it out and it is ready to use again! After each use, rinse well, wring it out well and place it in the storage tube while slightly damp. If you allow The Absorber to air dry, it becomes stiff. Simply rehydrate it in warm water and it comes back to life, ready to use again. Read the testimonials below to find out why pet owners and groomers love The Absorber. While dogs can’t speak, of course, we know they’re giving our pet drying towel the “paws up” sign!